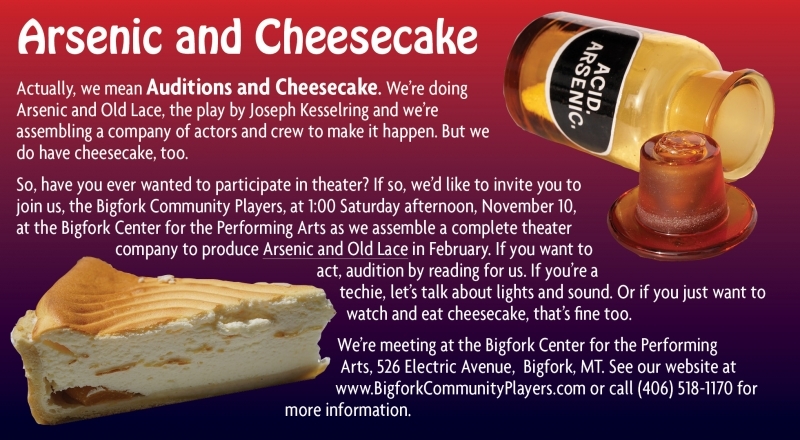 Bigfork Community Players is holding open auditions for the February 22nd - 24th production of Arsenic & Old Lace. Auditions will be at the Bigfork Center for the Performing Arts from 1 to 4pm on Saturday, November 10th. No previous experience necessary, just a desire to have fun and make new friends. Stage fright???? No problem, we have lots of positions off stage. The club is looking for people who want to learn sound & lighting design. Website & social media maintenance. Costume design, directing, set design, hair & makeup. You do not need to prepare or memorize a monologue to audition. It should take no more than 30 minutes of your time. We rehearse in the evening and sometimes on the weekends depending on the selected casts schedules. If November 10th isn't convenient for you, call Michele @ 518-1170 for a private audition.